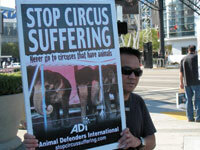 In July, Ringling Bros. and Barnum & Bailey Circus arrived in Los Angeles, and were greeted by ADI protests at every performance, giving out thousands of leaflets. Our leaflets also poured out before the shows in Annaheim, California, thanks to local campaigners there. In Austin, Texas, a special screening of our Stop Circus Suffering video was held at Counter Culture restaurant by Action for Animals Austin to generate awareness in the weeks before the circus comes to town. Action for Animals Austin will be distributing ADI leaflets and hope for a record breaking crowd of protestors when the circus opens. We have posters, leaflets, and DVDs available for campaigners to raise awareness whenever a circus with animals comes to town. Campaign materials are FREE (a donation is appreciated if you can afford it, to help us produce more). In June, Sacramento City Council unanimously approved the empowerment of animal care officers to inspect traveling circuses in order to enforce safe and humane living conditions for animals. ADI contacted each Council Member, urging support for the measure; many animal protection groups worked together in support.